Brady isn't expected to participate in voluntary team workouts this offseason, ESPN.com's Mike Reiss reports. Brady completed 21 of 35 passes for 262 yards with no touchdowns and one interception in the Patriots' 13-3 win over the Rams in Super Bowl LIII on Sunday. He also lost two yards on two rushes and fumbled once, but it was recovered by the offense. Brady said Sunday in an interview with ESPN reporter Jeff Darlington that he doesn't intend to retire after the Patriots' Super Bowl LIII matchup with the Rams. Brady completed 30 of 46 pass attempts for 348 yards, one touchdown and two interceptions during Sunday's 37-31 AFC Championship Game overtime win over the Chiefs. Brady completed 34 of 44 passes for 343 yards and a touchdown in Sunday's 41-28 divisional-round win over the Chargers. Brady, who had been managing a knee issue, benefited from the Patriots' bye week in advance of Sunday's divisional-round playoff contest against the Chargers, NFL.com reports. Analysis: Per the report, Brady previously dealt with an MCL sprain for a few weeks, but he's healed now and healthy heading into Sunday's game. The 41-year-old QB finished up the 2018 regular season with 4,355 passing yards and a 29:11 TD:INT ratio. Having shed his knee concern, Brady is now looking to help the Patriots advance to the AFC Championship Game for the eighth consecutive time. Brady completed 24 of 33 passes for 250 yards and four touchdowns in Sunday's 38-3 win over the Jets. He finishes the regular season with 4,355 yards and a 29:11 touchdown to interception ratio. Analysis: Brady's team was in control throughout in a game they needed to win to secure a first-round bye. He comes up short of the 30-touchdown mark for just the third time in the past nine seasons, but fantasy owners who invested in Brady on draft day largely got what they were expecting from him. Owners in dynasty formats should start lining up alternatives for the 41-year-old, though, as Father Time could lend a critical blow at any moment. 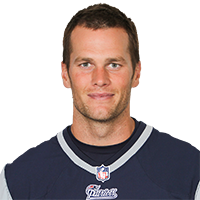 Brady said Wednesday that he plans to continue his career into 2019 and beyond, Mike Reiss of ESPN.com reports. "I have goals to not only play next year, but beyond that," Brady said in his weekly interview on Westwood One. "I'm going to try to do it as best I possibly can. I'm going to give it everything I have, like I always have." Brady wouldn't confirm that he was dealing with an injury when asked Monday on the "Mut & Callahan" radio program on WEEI Boston if he was nursing a partially torn MCL in his knee, Zack Cox of NESN.com reports. "I'm not getting into specifics of any injuries," Brady said. "It just doesn't make any sense." Brady completed 13 of 24 passes for 126 yards, one touchdown and two interceptions in Sunday's 24-12 win over Buffalo. Analysis: Brady couldn't get much going against the stout Buffalo secondary, as he had just 73 yards and two interceptions on his first 18 throws before finding Julian Edelman for a 32-yard touchdown on fourth down with 5:05 left in the third quarter. With a first-round bye hanging in the balance, look for Brady to step up at home against the Jets in Week 17. Brady completed 25 of 36 passes for 279 yards with a touchdown and an interception in the Patriots' 17-10 loss to the Steelers on Sunday. Brady has "zero concern" with regard to the knee issue that has had him listed on the Patriots' injury report at times over the last three weeks, NESN's Mike Cole reports. Brady completed 27 of 43 passes for 358 yards and three touchdowns during Sunday's 34-33 loss to the Dolphins. Brady (knee) has been removed from the Patriots' Week 14 injury report, Jim McBride of The Boston Globe reports. Analysis: Brady is thus good to go for Sunday's game against the Dolphins. The veteran QB's overall stats aren't eye-popping; his 3,342 passing yards in 12 games are ninth in the league, but Brady -- who has logged a 20:8 TD:INT ratio in that span -- maintains a decent enough fantasy floor while helming a well-coached offense with a variety of capable pass-catching weapons. Brady (knee) logged a limited practice Wednesday, Mike Reiss of ESPN.com reports. Analysis: Brady is in no danger of missing Sunday's game against the Dolphins, and there's a decent chance that he won't carry an injury designation for that contest once the Patriots' final Week 14 injury report is released Friday. Brady completed 24 of 32 pass attempts for 311 yards, one touchdown and one interception during Sunday's 24-10 win over the Vikings. Brady (knee) doesn't carry an injury designation into Sunday's game against the Vikings, Mike Reiss of ESPN.com reports. Analysis: Tight end Dwayne Allen, who won't play due to a knee issue, is the only player listed on the Patriots' unusually light Week 13 injury report. The Patriots also removed Rob Gronkowski (back/ankle) from their report, which should provide a boon to Brady's fantasy outlook for the second straight week. While there's no doubt regarding Brady's status for Sunday's contest, the Vikings' rugged defense poses a less-than-ideal matchup for the veteran signal-caller. Brady (knee) was a limited participant in Thursday's practice, Chad Graff of The Athletic reports. Brady (knee) was listed as a limited practice participant Wednesday, Ben Volin of The Boston Globe reports. Analysis: Brady was also limited at practice last week with the same issue in addition to an illness. He moved past both concerns to start and lead the Patriots to a 27-13 win over the Jets over the weekend. With no known setbacks in the contest, it's assumed that he'll be good to go for the Patriots' Week 13 game against the Vikings. Brady (knee/illness) completed 20 of 31 passes for 283 yards and two touchdowns in Sunday's 27-13 win over the Jets. 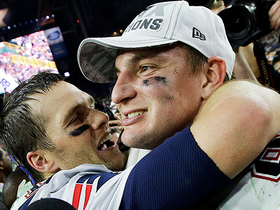 Analysis: Brady benefited from the return of Rob Gronkowski (back/ankle). He hit the tight end for a 34-yard touchdown in the first quarter and added a 21-yard score to Julian Edelman in the third. With this effort, Brady topped 3,000 passing yards for the 16th time in the past 17 seasons. He will bring a 19:7 touchdown to interception ratio into New England's Week 13 home meeting with the Vikings. Brady (knee/illness) is listed as active for Sunday's game against the Jets. Brady (knee/illness), who is listed as questionable for Sunday's game against the Jets, is set to play in the contest, Mike Giardi of NFL Network reports. Brady, who had been limited in practice earlier this week due to a knee issue, missed Friday's session due to an illness, Mike Reiss of ESPN.com reports. Analysis: The QB is officially listed as questionable for Week 12's game against the Jets, but he's expected to play this weekend, with that likely outcome set to be confirmed in advance of the first wave of kickoffs Sunday since the Patriots' road tilt is slated to kick off at 1:00 ET. Brady (knee) was not spotted at the media-access portion of Friday's practice, Mike Reiss of ESPN.com reports. Analysis: Previous reports suggested that Brady was in no danger of missing Sunday's game against the Jets, but this wrinkle makes his status worth monitoring closely leading up to that contest. With Brady not out there at the start of practice Friday, Brian Hoyer and Danny Etling were the only QBs on the field for the Patriots. Brady (knee) was listed as limited on Thursday's estimated practice report, Jim McBride of The Boston Globe reports. Analysis: The team didn't actually take the field Thursday, so how Brady looks at practice Friday will be telling. So far there's nothing to suggest that he's in any danger of missing Sunday's game against the Jets, though it's possible that Brady could approach that contest with an official "questionable" injury designation. Brady, who was limited at practice Wednesday with a knee issue, "should be fine going forward," Ian Rapoport of NFL Network reports. Analysis: Meanwhile, Michael Giardi of NFL Network echoes the notion that Brady's Week 12 availability is not in danger. That said, given the Patriots' injury-reporting tendencies, it's quite possible that the QB -- who appeared to tweak his knee during Week 10's loss to the Titans -- ends up being officially listed as questionable for Sunday's contest against the Jets. Brady was listed as limited at practice Wednesday with a knee issue. Analysis: As Kevin Duffy of the Boston Herald points out, Brady "took some shots against the Titans" in Week 10, but so far there's nothing to suggest that the quarterback's status for Sunday's game against the Jets is in any danger. Coming off their Week 11 bye, the Patriots continue to roster just two signal-callers, Brady and Brian Hoyer. Brady completed 21 of 41 passes for 254 yards without a touchdown or turnover while rushing once for no gain and catching a six-yard pass in Sunday's 34-10 loss to the Titans. Brady completed 22 of 35 pass attempts for 294 yards and a touchdown in Sunday's 31-17 win over the Packers. Brady completed 29 of 45 passes for 324 yards in Monday night's 25-6 win over the Bills. Brady completed 25 of 36 passes for 277 yards, three touchdowns and an interception while rushing once for six yards in Sunday's 38-31 triumph over Chicago. Brady completed 24 of 35 passes for 340 yards and a touchdown in a 43-40 win over the Chiefs on Sunday. He also scored a second touchdown on the ground. Brady completed 34 of 44 passes for 341 yards with three touchdowns and two interceptions in the Patriots' 38-24 win over the Colts on Thursday. He also rushed three times for minus-1 yard. Brady completed 23 of 35 passes for 274 yards with three touchdowns and two interceptions in the Patriots' 38-7 win over the Dolphins on Sunday. Brady completed 14 of 26 passes for 133 yards with one touchdown and one interception during Sunday's 26-10 loss to the Lions. He added two rushing yards on one carry. Brady completed 24 of 35 passes for 234 yards and two touchdowns while adding 10 yards on three carries and losing a fumble in Sunday's 31-20 loss to Jacksonville. Analysis: You don't hear this very often, but Brady was completely outplayed by Blake Bortles in this one. Jacksonville raced out to a 21-3 halftime lead and ended up easily avenging last year's playoff loss to the Patriots. Brady still managed to hit Chris Hogan for touchdowns of seven and 29 yards in the second half, and he should pick things up Sunday night against a Lions defense that's far less fearsome than the predatory cats he faced here. Brady completed 26 of 39 passes for 277 yards, three touchdowns and an interception during Sunday's 27-20 win over the Texans. Analysis: How would Brady fare without his go-to receiver, Julian Edelman, to start the season? Just fine, it seems. Twenty-five of his 39 attempts went to tight ends or running backs and he connected with two of his favorites, Rob Gronkowski and James White, in the end zone. Perhaps more importantly, Phillip Dorsett showed some ability to fill in for Edelman as the latter serves his suspension. A tough matchup looms against the Jaguars next week. Brady completed 12 of 18 passes for 102 yards while playing the whole first half of Friday's 25-14 loss to the Panthers in the third preseason game. Analysis: Brady didn't play into the second half as was expected by some, but still saw ample work in what was likely his last appearance of this preseason. Although he'll be disappointed by the fact he led the Pats to just three points while averaging under six yards per attempt, Brady should nonetheless be fired up to kick off his 19th season. The Patriots' plan for Brady and the team's healthy starters is to play them into the second half of Friday's preseason game against the Panthers, Jeff Howe of The Athletic Boston reports. Analysis: That comes with the caveat that Brady's playing time Friday will depend upon his offensive line's ability to keep him out of harm's way. Once Brady heads to the sideline, veteran Brian Hoyer and rookie Danny Etling are on track to finish up Friday's contest. Brady figures to sit out next week's preseason finale, a game which figures to prominently feature reserves battling for roster spots. Brady completed 19 of 26 passes for 172 yards and two TDs in Thursday's 37-20 preseason win over the Eagles. Brady is slated to play Thursday night against the Eagles, Jeff Howe of The Athletic Boston reports. Analysis: It remains to be seen how long Brady's 2018 preseason debut lasts, but there's been speculation that he might play "a good portion, if not all, of the first half" Thursday night, per Howe. Brady is on track to play in Thursday's preseason game against the Eagles, Mike Reiss of ESPN.com reports. Analysis: Reiss goes on to say that "it wouldn't be a surprise if (Brady plays) fairly deep into the first half," while noting that "these things are always subject to change, but that's where things stand at this time." Given the different range of potential outcomes here, there are safer DFS plays this week, but it does appear as though Brady is poised to get his first in-game tune-up in advance of Week 1. Brady (back) said he absolutely expects to play in Thursday's preseason game against the Eagles, Kevin Duffy of MassLive.com reports. Analysis: Brady was held out of the Pats' preseason opener with a sore back, though he may not have played even if he had been completely healthy. He'll probably only play one or two drives in Thursday's exhibition, making his first in-game appearance with a wideout group that no longer includes Brandin Cooks and Danny Amendola. The Patriots used Julian Edelman (suspension), Phillip Dorsett and Chris Hogan as the first-team wide receivers for Brian Hoyer in last week's win over Washington. Brady (back) increased his workload at Sunday's practice, Mike Reiss of ESPN.com reports. Analysis: Brady missed the Patriots' exhibition opener Thursday with what was termed a sore back, which may have been a smoke screen for the veteran quarterback. There's not much reason for the team to press its luck with the 41-year-old, but the mere fact he participated in team drills Sunday bodes well for him being available Thursday in a Super Bowl rematch with the Eagles. Brady missed Thursday's preseason opener due to a sore back, Jim McBride of the Boston Globe reports. Analysis: Brady has reportedly seen a lighter workload in practice over the last week, but there's nothing to suggest the quarterback is dealing with any sort of serious injury. That said, it wouldn't be a surprise if Brady continues to sit out any or all of New England's remaining preseason games with the aim of being fully ready for the start of the regular season. With backup quarterback Brian Hoyer taking first-teams reps during warmups, Brady is unlikely to play in Thursday's preseason opener against the Redskins, Zack Cox of NESN.com reports. Analysis: Earlier Thursday, there were rumblings that Brady and the Patriots were closing in on a restructured deal that is expected to include "performance escalators," per Jeff Howe of The Athletic Boston. While an agreement hasn't been reached, it appears Brady will yield to Hoyer on Thursday with no need to press his luck, health-wise. As expected, Brady participated in Tuesday's mandatory minicamp practice, the Patriots' official site reports. Analysis: The same applies to star tight end Rob Gronkowski, with Brady now set to begin building his on-field rapport with his pass catchers, a group that includes newcomers such as Jordan Matthews, as well as returnees Julian Edelman and Malcolm Mitchell, who are both bouncing back from injuries that kept them out of the mix in 2017. Patriots owner Robert Kraft relayed that Brady told him that he plans to attend the team's mandatory minicamp, which opens up June 5, ESPN's Mike Reiss reports. Analysis: Brady has been skipping the team's voluntary workouts, but the QB has been working out of late at the TB12 Sports Therapy Center and there's little concern over his conditioning. Once Brady is back with the Patriots, he'll begin the process of building rapport with his pass catchers, a group that includes several newcomers, including Jordan Matthews, as well as players like Julian Edelman and Malcolm Mitchell, who are bouncing back from injuries. Brady will not be present for the opening of the Patriots' OTAs on Monday, ESPN's Mike Reiss reports. Brady said Monday that he still plans to play football this season, ESPN.com's Mike Reiss reports. "I have personal goals," said Brady. "I want to keep playing. I've said for a long time I want to play to my mid-40s. I was told three years, when I was 36-37, 'You can't keep playing; no one wins Super Bowls [at that age].' It's a great challenge for me. I think I've been challenged my whole life. I feel like I can do it." Brady's agent, Don Yee, said that he expects the QB to play this coming season, Adam Schefter of ESPN reports. "Tom's intentions have not changed," Yee relayed Monday. "He's consistently said he'll play beyond this contract and into his mid 40s, or until he feels he isn't playing at a championship level. 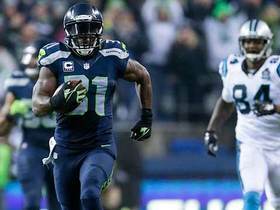 I understand the constant speculation, but this is one point he's been firm about." Brady is expected to play the 2018 season, Chris Wesseling of NFL.com reports. However, Brady and his representation would like to look into a new contract. "It's not a pressing issue," Mike Garafolo of NFL Network said Wednesday. "It's not anything that is contentious right now." Brady hasn't committed to playing in 2018, though he's expected to do so, Adam Schefter of ESPN reports. 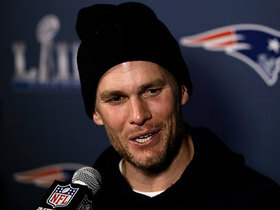 Brady is unlikely to be a regular participant in the Patriots' offseason program, Jeff Darlington of ESPN.com reports. Brady said Wednesday that he isn't upset with the Patriots' decision to trade Brandin Cooks to the Rams, Ian Rapoport of NFL Network reports. Brady completed 28 of 48 passes for 505 yards with three touchdowns and no interceptions during the Patriots' 41-33 loss to the Eagles in Super Bowl LII on Sunday. He also rushed once for six yards and had a key fumble on a strip-sack with 2:09 remaining. Brady sported a glove on his right (throwing) hand during Tuesday's media availability session in advance of Super Bowl LII, NFL.com reports. "It's a great glove," Brady noted Tuesday. "It's got a lot of recovery in it, and that's what I need." Brady had 12 stitches removed from his right hand earlier this week, Ian Rapoport of NFL Network reports. Analysis: Brady required stitches to repair a laceration he sustained in practice leading up to the Patriots' AFC championship victory over the Jaguars. However, Brady emerged from that game setback-free, has been a full participant in practice since last Friday, and does not carry an injury designation in advance of Super Bowl LII. Brady (right hand) practiced fully Friday. Brady (right hand) was listed as a limited practice participant Thursday. Analysis: Though Brady wasn't listed on Wednesday's estimated practice report, it's not surprising that the QB was listed as limited Thursday, considering reports that he had 12 stitches in his throwing hand in advance of the Patriots' win over the Jaguars in the AFC championship game. With no reports setbacks since then, we'll operate under the assumption that the QB's limitations Thursday were maintenance-related. At this stage, there's zero concern regarding Brady's availability for Super Bowl LII. Brady (hand) is not listed on Wednesday's practice report estimate. Analysis: Brady reportedly received 12 stitches in his right (throwing) hand in advance of this past Sunday's AFC championship game, but the issue isn't expected to limit the QB in his preparation for the Super Bowl. While Brady's hand/thumb presumably still has some healing to do, his availability for Feb. 4's big game against the Eagles is not in any doubt at this time. Brady said Monday that he would have the 12 stitches in his right (throwing) hand removed in the coming days, Mike Reiss of ESPN.com reports. "Hopefully some time this week. And at that point, again, because I was fortunate not to tear any ligaments or anything like that [after injuring the hand in practice last week] -- there was no broken bones -- that was obviously the best news I could ever hear based on what you thought it could be," Brady told the "Kirk and Callahan Show." "It ended up being a lot of good luck after, I'd say, a pretty unlucky injury. It turned out to be a lot [of] good luck it wasn't more serious than it was." Brady completed 26 of 38 passes for 290 yards with two touchdowns and no interceptions in Sunday's 24-20 AFC championship game win over the Jaguars. He netted zero yards on his five rushes. Brady (hand) is active for Sunday's AFC championship game against the Jaguars. Brady (right hand) is in line to start Sunday's AFC championship game against the Jaguars, ESPN.com reports. The Patriots list Brady (right hand) as questionable for Sunday's AFC championship game against the Jaguars after the QB logged a limited practice Friday, Mike Reiss of ESPN.com reports. When asked at a press conference Friday how confident he is about playing in Sunday's AFC championship game against the Jaguars, Brady (right hand) replied, "we'll see," Mike Reiss of ESPN.com reports. Brady (right hand) was present for the start of Friday's practice, Zack Cox of NESN.com reports. Analysis: Brady was also present for warmups ahead of Thursday's practice, but the quarterback was ultimately listed as a non-participant for that session. The media was only able to see the players stretch and jog, so it is yet to be determined whether Brady will be able to resume throwing the football Friday, but more clarity should come on him once the Patriots release their final injury report later on in the day. Though Brady (right hand) was present for warmups in advance of practice Thursday, per ESPN's Mike Reiss, the QB was officially listed as a non-participant. Brady, who jammed his right (throwing) hand at practice Wednesday, was present for Thursday's session, Jeff Howe of the Boston Herald reports. Brady (right throwing hand) is in line to start Sunday's playoff game against the Jaguars, barring any unexpected setbacks, Jeff Howe of the Boston Herald reports. Analysis: Per Karen Guregian of the Boston Herald, the QB jammed his hand at practice Wednesday after "accidentally being run into." Subsequent X-rays revealed no structural damage, but we suspect that the issue could limit Brady some at practice Thursday and Friday. Brady was listed as a limited participant at Wednesday's practice due to an injury to his right (throwing) hand. Analysis: While there's nothing at this stage to suggest that Brady's availability for Sunday's AFC championship game against the Jaguars is in any danger, this is a new injury for him to deal with. His participation in practice warrants monitoring over the next two days. Brady is slated to appear on the Patriots' injury report following the team's first practice of the week Wednesday, Mike Reiss of ESPN.com reports. Analysis: The report adds that Brady is set to meet with the team's medical staff Wednesday, after which the nature and extent of his injury should be known. While there's no reason to believe that Brady's availability for Sunday's AFC championship game against the Jaguars is in any peril, it nonetheless appears as though he's banged up at this point. Brady carved up Tennessee's defense for 337 yards and three touchdowns while completing 35 of 53 passes in Saturday's 35-14 divisional-round triumph. Brady completed 18 of 37 passes for 190 yards and two touchdowns during Sunday's 26-6 win over the Jets. Brady (Achilles/left shoulder) does not carry an injury designation for Sunday's game against the Jets. Analysis: Brady -- who leads the league with a fantasy-friendly 4,387 passing yards -- took a maintenance day Wednesday to receive extra treatment from the team's training staff, but he'll start Sunday's game and should remain in the contest as long as the outcome is in question. With a win Sunday, the Patriots would clinch the AFC's No. 1 playoff seed. Brady (Achilles/left shoulder) returned to practice Thursday, Jeff Howe of the Boston Herald reports. Analysis: Brady was given a maintenance day Wednesday to receive extra treatment on what the report describes as a bruised Achilles and mildly sprained left shoulder. In any case, the QB remains slated to start Sunday's game against the Jets, an outcome that will presumably be confirmed Friday assuming Brady -- who was limited Thursday -- is removed from the Patriots' final Week 17 injury report. Brady (Achilles/left shoulder) missed practice Wednesday. Analysis: Brady has previously managed an Achilles' issue this season, but the left (non-throwing) shoulder injury is something new. That said, we suspect that the QB's absence from practice Wednesday was simply a case of Brady getting some extra treatment in advance of Sunday's game against the Jets. The Patriots need a win in the contest to secure the top playoff seed in the AFC, so resting players healthy enough to suit up is not in the conversation for New England in Week 17. Brady (undisclosed) wasn't spotted during the portion of Wednesday's practice available to the media, Zack Cox of NESN.com reports. Analysis: A formal update on Brady's status will be available later Wednesday when the Patriots issue their first practice report of the week, but his absence isn't believed to be the result of any serious injury. Brady has often received Wednesdays off in previous weeks to receive routine maintenance. Brady completed 21 of 28 passes for 224 yards, to go along with two TDs and a pick in Sunday's 37-16 win over the Bills. He also ran twice for six yards in the contest. Analysis: With the win, the Patriots will head into next weekend's season finale with a 12-3 record. At this stage, it looks like the team will be playing for playing seeding in Week 17, but that would change if the Steelers and Jaguars stumble in their Week 16 contests. Brady completed 22 of 35 passes for 298 yards, one touchdown and one interception during Sunday's 27-24 victory over the Steelers. Brady (Achilles) practiced fully Wednesday. Analysis: Brady had been using recent Wednesdays to get extra treatment from the Patriots training staff, but in the wake of a subpar effort in Monday's 27-20 loss to the Dolphins, the QB is listed as working fully out of the gate this week. He's a bounce-back candidate in Sunday's showdown on the road against the Steelers, a contest that looms large in terms of AFC playoff seeding. Brady completed 24 of 43 passes for 233 yards, a touchdown and two interceptions in Monday night's 27-20 loss to the Dolphins. Brady (Achilles) will not carry an injury designation into Monday night's game against the Dolphins, Doug Kyed of NESN.com reports. Analysis: Brady and the Patriots actually opted for him to receive injury treatment rather than practice Saturday, but avoiding the questionable tag should quell most concerns. The veteran signal caller has played through the injury the last few weeks and is primed to continue that against the Dolphins in Week 14. Brady (Achilles) was listed as a limited participant at Friday's practice. Brady (Achilles) suited up for Friday's practice, Tom Pelissero of NFL.com reports. Analysis: Brady was held out of the Patriots' initial practice of the week Thursday in order to rest his sore Achilles, but he was able to get back on the field just one day later. He went through a similar practice pattern last week and didn't carry an injury designation heading into the team's eventual win over the Bills, so there's little reason not to expect him to play in Monday's matchup with the Dolphins. Brady (Achilles) wasn't present for the start of Thursday's practice, Mike Reiss of ESPN.com reports. Analysis: As a result, Brian Hoyer is taking all the reps at quarterback with the first-team offense Thursday. Since the Patriots aren't playing until Monday against the Dolphins, it's likely that Brady is just being held out for maintenance-related reasons, as the Achilles' issue hasn't prevented him from missing any time this season. Brady once again shapes up as one of the top fantasy options at quarterback in Week 14. Brady (Achilles) wasn't present for Wednesday's practice, Mike Reiss of ESPN.com reports. Analysis: There's nothing too troubling about the quarterback's absence from the session, as Brady has been using Wednesdays lately as opportunities to receive extra treatment for his aches and pains. While it's expected that Brady will be listed on the Patriots' Week 14 injury report, look for him to approach Monday's game against the Dolphins without an injury designation. Brady completed 21 of 30 passes for 258 yards with no touchdowns and one interception in Sunday's 23-3 win over the Bills. Analysis: Brady had a modest line by his standards, as the Patriots were able to lean plenty on the running game Sunday versus a vulnerable Bills rush defense. When Brady did drop back, he often found an open Rob Gronkowski, who he connected with on a team-leading nine occasions for 147 yards. It was the future Hall of Famer's first game without a touchdown pass since the season opener versus the Chiefs, a matter he'll look to quickly rectify in a Week 14 road tilt against the Dolphins. Brady (Achilles) does not carry an injury designation for Sunday's game against the Bills. Analysis: After managing his aches and pains by sitting out practice Wednesday, Brady returned to a limited session Thursday, before ultimately being removed from the Patriots' Week 13 injury report. Brady leads the NFL with 3,374 passing yards through 11 games and also owns a nifty 26:3 TD:INT ratio. Starting him in season-long formats is an easy call, and more often than not he'll justify his high price tag in DFS contests. Brady (Achilles) was listed as a limited practice participant Thursday. Analysis: It remains to be seen if Brady -- who was sidelined Wednesday -- draws an official questionable designation for Sunday's contest against the Bills, or is simply removed from the Patriots' final Week 13 injury report, but either way there appears to be little danger that he'll be out this weekend. Brady (Achilles) returned to practice Thursday, Jeff Howe of the Boston Herald reports. Brady missed Wednesday's practice with an Achilles issue. Analysis: It's an ailment that the QB managed last week by getting extra treatment Wednesday, before returning to practice Thursday and being removed from the team's final injury report Friday. It wouldn't surprise us to see that pattern replicated in advance of Sunday's game against the Bills. Brady wasn't present for the start of Wednesday's practice, Mike Reiss of ESPN.com reports. Analysis: Added clarity on Brady's status will arrive upon the release of the Patriots' first practice report of Week 13. With no reported setbacks with his Achilles in Sunday's 35-17 win over the Dolphins, however, there's a pretty good chance that Brady's absence is maintenance-related, similar to last Wednesday, when the quarterback received extra treatment while his teammates practiced. Brady completed 18 of 28 passes for 227 yards with four touchdowns and one interception in Sunday's 35-17 win over the Dolphins. He also lost four yards on five rushes and fumbled twice, losing one. Brady (Achilles) does not carry an injury designation for Sunday's game against the Dolphins after practicing in a limited fashion Thursday and Friday. Brady (Achilles) returned to a limited practice Thursday, the Boston Herald reports. Analysis: Brady sat out Wednesday's practice, but his return to the field Thursday reinforces the notion that he's in no danger of missing Sunday's game against the Dolphins. It remains to be seen, however, if the QB draws an official questionable designation for the contest, or is simply removed from the Patriots' final Week 12 injury report come Friday. The reason cited for Brady's absence from practice Wednesday is an Achilles issue, Mike Reiss of ESPN.com reports. Analysis: While it's a new injury for Brady, Jeff Howe of the Boston Herald suggests the injury isn't a major concern and that Brady remains in line to play Sunday against the Dolphins. Brian Hoyer, the only other signal caller on either the Patriots' roster or practice squad, will be in line for added practice reps as long as Brady manages his current aches and pains. Brady (undisclosed) wasn't present for Wednesday's practice, Mark Daniels of The Providence Journal reports. Brady completed 30 of 37 passes for 339 yards and three touchdowns in Sunday's 33-8 win over the Raiders. Analysis: He threw for a score in each of the first three quarters, with the final blow being a 64-yard bomb to Brandin Cooks. The duo also connected on a 52-yarder in the second quarter, and Brady had little trouble dicing up the Raiders defense during any other part of the game. The former Wolverine has another plus matchup at home against the Dolphins in Week 12. Brady completed 25 of 34 passes for 266 yards and three touchdowns during Sunday's 41-16 victory over the Broncos. Analysis: Brady put the Patriots on top early and didn't ease up until he was subbed out in the closing minutes with his team nursing a 25-point lead. The 40-year-old is now on pace for nearly 5,000 passing yards -- which would mark the second-highest total in his illustrious career -- not to mention 34 touchdowns. Brady should make easy work of the Raiders in Week 11 against a talent-barren Oakland secondary that's yet to record an interception in 2017. 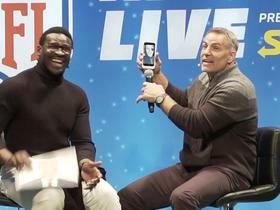 New England Patriots quarterback Tom Brady dials up NFL Network's Kurt Warner and discusses the possibility that he could play in a Super Bowl in the UK. 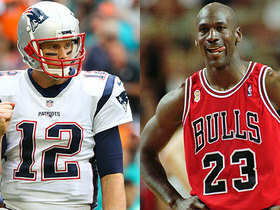 NFL Network's Adam Rank's explains where New England Patriots quarterback Tom Brady lands on his list of the greatest athletes ever. 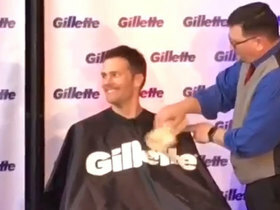 Watch New England Patriots quarterback Tom Brady shave his playoff beard to raise money for charity. 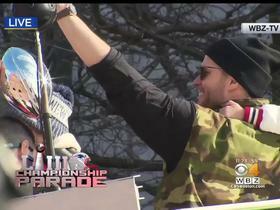 New England Patriots Tom Brady takes in Super Bowl LIII parade with daughter. 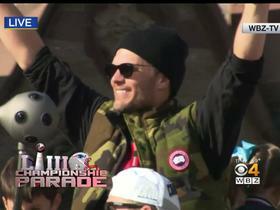 New England Patriots quarterback Tom Brady waves at New England fans during sixth Super Bowl parade. 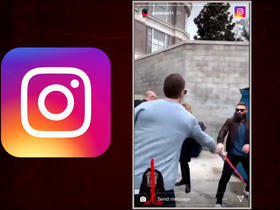 Watch New England Patriots quarterback Tom Brady and wide receiver Julian Edelman duel each other with lightsabers at Disney World in Edelman's Instagram video. 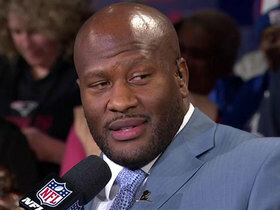 Former Pittsburgh Steelers linebacker James Harrison joins 'Super Bowl Prime' and gives his thoughts on quarterback Tom Brady. New England Patriots quarterback Tom Brady talks about New England Patriots fullback James Develin and his impact towards the team.